Hi! I'm an elemental weapon Italian guy who likes games and programming. Nice to meet you! GBC Toki Tori "all levels" in 1:02:43.11 by ThunderAxe31. Toki Tori is a puzzle made by Two Tribes for the GBC in which you must use the skills available to you to advance through 60 levels, seperated into 4 worlds of 15 levels. Skills include building ladders to cross gaps that your jump can't make, warping to other areas of the level or building gaps for enemies to fall through. ThunderAxe31 completes all levels, including the Hard levels, in record time, while improving his previous movie by 8.50 seconds. GBA Crash Bandicoot: The Huge Adventure (USA) in 32:51.57 by ThunderAxe31. Crash Bandicoot: The Huge Adventure is the first Crash Bandicoot game on a handheld console. 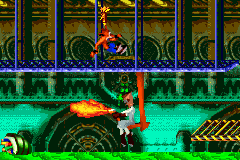 In this game, Crash is off to save the world as Doctor Neo Cortex has shrunk the Earth using his "Planetary Minimizer". Join ThunderAxe31 as he slides, jumps, flies, swims and spins through 4 Warp Rooms, gathers Crystals and fights Doctor Neo Cortex and his minions to return the world to normal again! GBA Pac-Man World (USA) in 21:09.52 by ThunderAxe31. Pac-Man World is a 1999 video game for the PlayStation and Game Boy Advance. It was released to coincide with the 20th anniversary, with the character Pac-Man going to a birthday party. A Game Boy Advance version would be released in 2004, with many features removed. Pac-Man World is a platform game played in 3D graphics that plays heavily into the history of the character; every non-boss level features a maze that plays by the rules of Pac-Man. 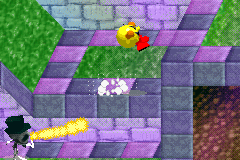 Every level is littered with Pac-Dots, fruits and ghosts, much of the music is modified from early entries into the series. Note: the audio crackling is the result of inaccurate emulation. There are currently no emulators able to correctly replicate the audio of this game. Genesis Golden Axe "The Duel" in 03:02.9 by 01garland01 & ThunderAxe31. Golden Axe is a side-scrolling, beat 'em up, arcade video game released in 1989 by Sega for the System 16-B arcade hardware. It is the first game in the Golden Axe series. 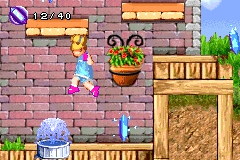 The game was ported to the Sega Genesis and Master System consoles, among many other systems. The game puts players in the shoes of one of three heroes, each with his own reason for trying to overthrow the evil rule of Death-Adder, who - along with his forces of darkness - kidnapped and imprisoned the King and his daughter and stole the legendary Golden Axe. This movie plays through The Duel mode, a survival mode type game that pitted players against increasingly powerful foes in consecutive rounds of play. We also have a TAS of the main game mode. GB Tobu Tobu Girl (unknown) "all levels" in 02:42.92 by Eltrion & ThunderAxe31. Tobu Tobu Girl was originally part of the third GBJam game jam and was later fleshed out to this arcade platformer you see here. Your cat is floating into space and you must jump, dash and flap against the clock to retrieve your pet before it's too late. Rejected because the current TASing tool is unable to dump this game's sound effects. Cancelled because I failed to meet the game completion requirements (game freezes after the credits) and because a different version of the game can be beaten faster by using the same glitch. Submitted as an April Fools' joke for anyone who could have expected my TAS of GBA Crash Bandicoot: The Huge Adventure. Rejected because the run itself was actually just a sloppy playthrough. Rejected due to completely redaundant content to the full completion movie. Submitted as an April Fools' joke. Rejected because of goal and suboptimality. 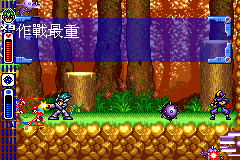 Submitted as an April Fools' joke for anyone who could have expected the TAS of GBA Dragon Ball: Advanced Adventure... Does it sound familiar? While desperately trying to improve the current publication, I came to the idea of exploiting the password system in order to make the game harder. The problem here is that the password system in Rolan's Curse is not used for accessing an actual difficulty option, but as a mean of storing game progress data, which makes this concept arbitrary and thus unapplicable for Vault tier. The relative movie rule was soon clarified in order to exclude this possible loophole. Submitted as an April Fools' joke. The movie does actually sync on emulator... You may be wondering how. I'll just quote myself: "How can exploits be real if games aren't real?" GBA Crash Bandicoot: The Huge Adventure "101%"
GB Rolan's Curse "2 players"
Feel free to contact me in case you want to co-work for any of these TASes. Some neat utilities I created. From a noob, for noobs. Utility that compares two given files and tells the exact percentage of how much different they are. It can also tell you the exact places where the two files are different. In order to use it, you need to simply drag and drop both files onto the exe icon. You can also launch it from command line, but seriously, why bothering to do that when you can just drag and drop?? Minimal interface for youtube-dl. Download youtube-dl and you put this little .bat file in the same folder, then launch it with a double click. A cmd window will show up. Just right click on it, paste the url of the video that you want to download, and press enter! If you have connection issues, don't worry: in case of connection lost, it resumes download right away, until the video is completely downloaded. If you need to download Nicovideo videos, you need to first edit this .bat file with notepad. Just replace "my_username" with your Nicovideo username, and replace "my_password" with your Nicovideo password. Don't worry, it's safe. Script that allows to see the player even when the screen is completely glitched out. This is just a lua script, however I can't upload it in the userfiles because it depends on some .png files. Many, actually. In any case, everything is included in the .zip file. Just extract it where you want and use it with BizHawk. This page appears to be the personal page of ThunderAxe31.